This statuesque and sultry Taldan beauty has green eyes, long, flowing brown hair, and natural bronzed skin further tanned by the Garundi sun. No one knows her last name, if she has one. She is exceptionally attractive and sensual, and though she no longer maintains the typical dancing girl garb of a concubine, she still acts and dresses provocatively, favoring low-cut, tight bodices, bare midriffs, perfumes and jewelry, and flowing, gauzy dresses that reveal her legs. Her formal dresses are generally white silks, tinged with pale blue to match her master Snowflake. She easily wraps most men around her fingers, and seems immensely self-assured when doing so. An ornate, curved dagger is tied to her sash at the small of her back. 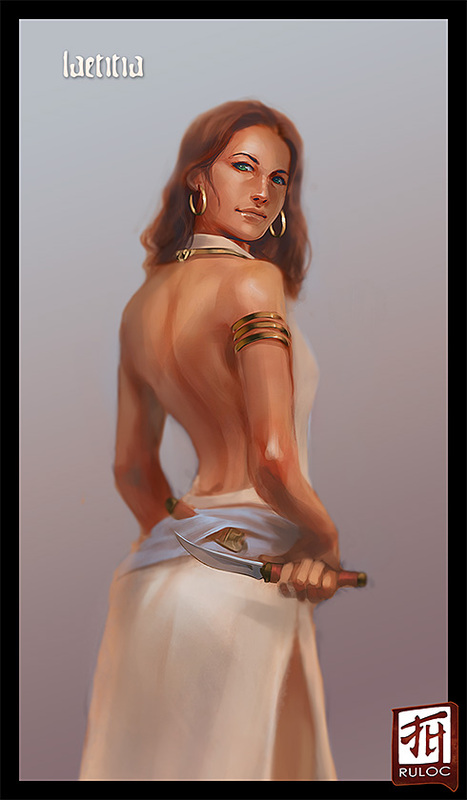 When dressed for self-defense, Laetitia dispenses with perfumes and most of her jewelry, replacing them with lightweight desert robes and a chain shirt of glittering mithral over her usual fashionable garb. She adds an ornate rapier to her belt and keeps a shortbow and quiver slung over her back alongside her backpack.